We don’t live close to the ocean, but we aren’t far from the Great Lakes. At the beginning of our unit we took a trip to Lake Ontario. In just a few minutes I collected everything for our Nature Exploration Bin. After putting together the bin I found a package of 6 unique shells at Michaels on clearance for $0.50 so I added those as well. To introduce the bin I picked up each type of item, told the children the name of the item and described it a little. I passed around the sample, showing them how to carefully handle it. They all sat and explored together for quite awhile, and revisited it throughout the month. 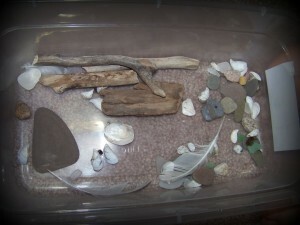 This entry was posted in What We're Doing and tagged Beach, bin, nature, Sensory, shell. Bookmark the permalink.